The City of Oakland filed a federal antitrust and breach of contract lawsuit against the Raiders on Tuesday, calling the team’s move to Las Vegas “illegal” while seeking to recover financial damages lost to the scheduled 2020 relocation. A lawsuit against the Raiders filed Tuesday by the city of Oakland won’t stop the team from relocating to Las Vegas. The federal antitrust and breach of contract lawsuit against the team, the National Football League and the NFL’s 31 other teams calls the Raiders’ move to Las Vegas “illegal” while seeking to recover financial damages lost as a result of the scheduled 2020 relocation. Because damages can be tripled in an antitrust action, they could total hundreds of millions of dollars. Steve Hill, chairman of the Las Vegas Stadium Authority, said late Tuesday that the seven-count, 353-page lawsuit filed in U.S. District Court for the Northern District of California wouldn’t affect the team’s move to Southern Nevada. Neither is it expected to slow construction of the 65,000-seat, $1.8 billion indoor stadium being built at Interstate 15 and Russell Road west of Mandalay Bay and the Strip. 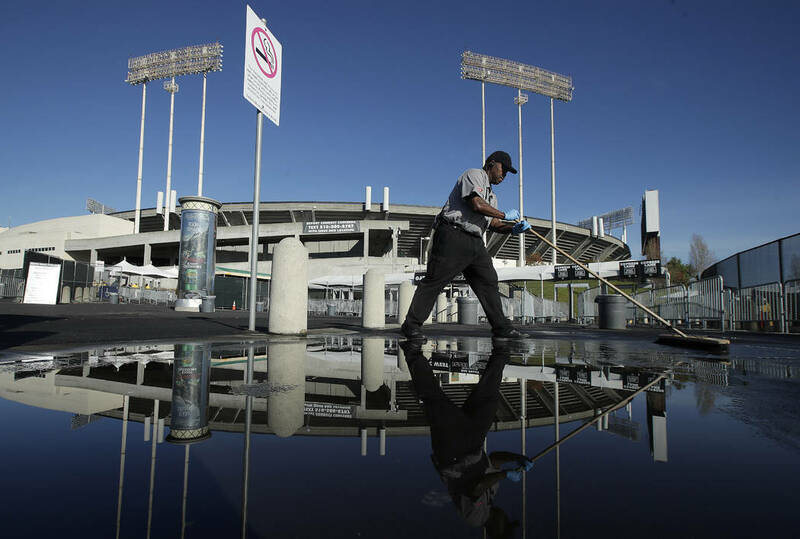 But Oakland’s strategy is built on recovering money Oakland taxpayers invested in the Raiders and other costs to help pay off approximately $80 million in debt remaining from renovations to the Oakland-Alameda County Coliseum where the Raiders now play. Parker’s filing was approved in a July 24 City Council meeting. 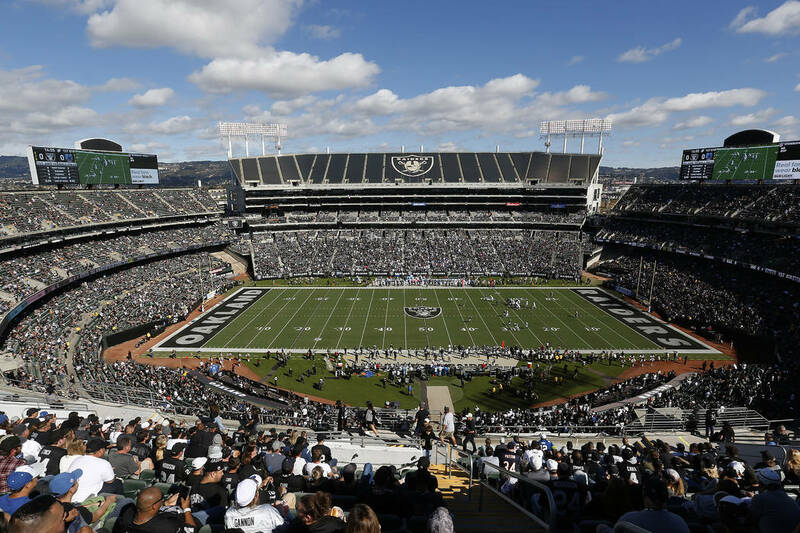 Effectively, the Raiders appear increasingly less likely to play their home games in Oakland next season. Such has been the organization’s position if the antitrust lawsuit was filed. The club’s lease at the Coliseum is set to expire in 2019. Team owner Marc Badain declined comment Tuesday when asked if the filing conclusively meant the Raiders won’t play in Oakland next year. For months, the Raiders have developed contingency sites in the event their lease is not extended. Clark County Commission Chairman Steve Sisolak, who has since been elected governor of Nevada, has said it would be too costly to renovate Sam Boyd Stadium in Las Vegas to make it playable for NFL football. Two legal experts indicated they were perplexed with the city’s strategy of filing an antitrust action. Stephen F. Ross, a professor of law at Penn State University, said no city has ever won an antitrust action against the NFL and that it’s clear the city isn’t trying to keep the Raiders in Oakland. A representative of Oakland’s legal team did not return email inquiries about why they weren’t fighting to keep the team in Oakland and why the lawsuit names all 32 NFL franchises. “What I think is interesting about the complaint is that they complain that the NFL is a monopoly — which is true — and they complained that because the NFL is a monopoly, the NFL is able to exploit taxpayers by raising the price of the franchise — that’s also true,” Ross said. John Wolohan, a Syracuse University law professor, noted the irony that the city of Oakland is attempting to take action the same way former Raiders owner Al Davis did when moving his team from Oakland to Los Angeles in 1982. Oakland doesn’t appear to be making any attempt to preserve the Raiders legacy in Oakland, he said. In 1996, the Cleveland Browns relocated to Baltimore, and the team, the city of Cleveland and the NFL approved a compromise enabling Cleveland to keep its colors and trademarks, and the new team in Baltimore became the Ravens. “It was like, ‘Fine, you can go. You can pay your way out of Cleveland, but you’re leaving your colors and you’re leaving the history,’” Wolohan said of the settlement. While he doesn’t believe the antitrust action has merit, Penn State’s Ross said he finds it interesting that Jim Quinn, the lead attorney for Berg & Androphy, is working the case pro bono and will only be paid if the lawsuit is successful. Ross said he doesn’t believe Oakland has any standing in intervening in NFL relocation rules and that the move to Las Vegas was a matter of the Raiders trying hard to get a deal in Oakland and finally being wooed to Nevada. Contact reporter Michael Gehlken at mgehlken@reviewjournal.com. Follow @GehlkenNFL on Twitter. Contact Richard N. Velotta at rvelotta@reviewjournal.com or 702-477-3893. Follow @RickVelotta on Twitter. The Associated Press contributed to this report.